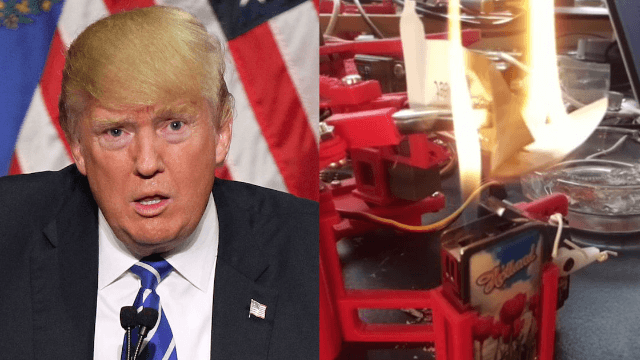 A true genius built a robot to literally burn Trump where it hurts him the most. An anonymous modern day hero has invented a robot that prints and burns Donald Trump's tweets. Finally! Every day I have had to print out every single tweet on my ancient printer that takes an hour to turn on. Then I have to burn them individually and, frankly, I'm exhausted. And now I can rest. Isn't it enchanting? It's like art in motion. I could watch this robot work for hours. And it seems like I might have to. Because Donald Trump keeps tweeting. And the robot keeps burning them. That's right, this heroic, tireless robot is burning every single Trump tweet. But that's not all it does! Sometimes it tweets at comedians. Trump scraps federal climate change rules. Some day history will look back at this day and think nothing because we will all be dead. @ABC7John I am a robot that automatically prints and burns trumps tweets. This robot is like an overeager college grad that can't stop giving out their resume at inappropriate times, and you have to admire its ambition. Get out there, young robot that prints and burns Trump's tweets. The world is yours.